Vous pourrez profiter de la riche histoire de chasse à la baleine, les opérations laitiers, la pêche de l'ormeau, et de la conserve qui étaient parmi beaucoup d'entreprise prospère qui AM Allan exploité sur cette propriété historique datant de 1898. Cette maison à deux niveaux est parfaitement situé pour maximiser les vues de Point Lobos et se trouve à quelques pas de la plage du monastère - célèbres pour la plongée et battant la houle. Prenez plaisir à les balayer vues panoramiques sur l'océan de Point Lobos et une plage de sable blanc que votre arrière-cour. Les plongeurs viennent de loin pour profiter des forêts de varech, les loutres, les phoques, les baleines et d'autres animaux sauvages trouvés dans les eaux au large de la plage du monastère. Planchers de bois franc, une cheminée et de grands panneaux de verre brouillent les lignes entre vie intérieure et extérieure. 3 chambres d'hôtes sur la propriété. Deux 2 chambres une 3 chambres. S'il vous plaît nous contacter pour les tarifs de vacances. Five beautiful days watching the seabirds and reading. This is a very peaceful and warm cottage. The views of the Pt Lobos seascapes are amazing. Only thing I would change is a kitchen knife that is not serrated. We will of course come back to this wonderful house and setting. Whalers Cottage is a very unique property. 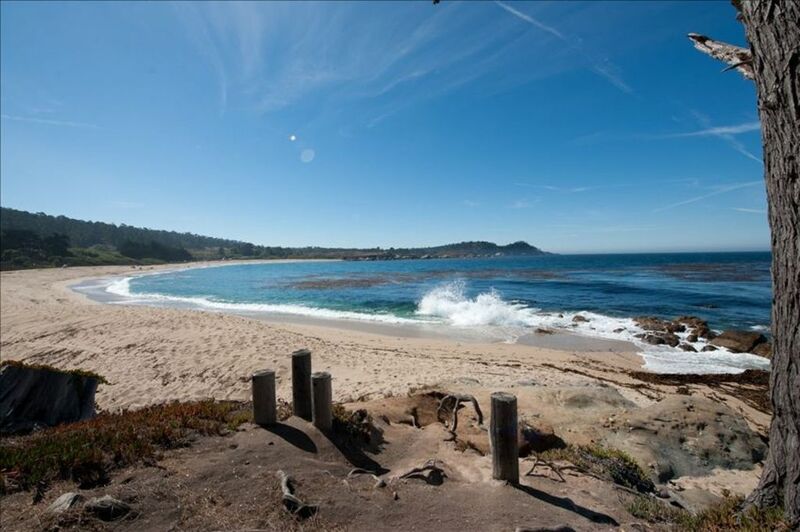 The location is spectacular, with panoramic views of Monastery Bay and Point Lobos. The cottage is quaint and comfortable. It will remind many of old time beach cottages from their childhood, but it is cozy, well appointed & well maintained. We spent a majority of our time just enjoying the spot. If we went out on day trips, we soon returned , not wanting to miss the play of light on the waves or looking for dolphins and other sea life. This was a special family trip & it couldn’t have been more memorable. Thank You for staying with us, please come back soon. Use your senses with the sight of the ocean and the sound of the waves, they are very captivating. We were able to complete two long walks each day going by the beach or on the different trails. We enjoyed From Scratch for a breakfast at the Barnyard. Dogs accepted. Having Ranger, our dog, was the best. Thank you very much Pat, Sara, Mark and Eileen for your hospitality. Thank you so much for staying with us, please come back soon. Staying in the Whalers Cottage was a joy! The cottage was a mixture of historic touches and modern conveniences. It was comfortable and well-stocked with plenty of windows facing the backyard and ocean. We had visits every day from rabbits, herons, quail, hawks, dolphins, and sea otters. The beach was just steps from the backyard but the trees give you a sense of privacy from the public. You are located just a few minutes from the gorgeous Point Lobos Reserve as well as close to other popular locations like the 17 mile drive, Monterey Bay Aquarium, Elkhorn Slough, Bixby Bridge, and whale watching. But you could spend your entire vacation just sitting on the beach or backyard with binoculars in hand, experiencing the most relaxing vacation of your life. If you have not fallen asleep to the sound of ocean waves, then you need to book this cottage at once. This lovely cottage is the perfect get away without losing convenience to nearby Carmel and Monterrey. The privacy and views are just amazing! It was exciting to see the scenery change from day to day according to the weather. The owners are great to work with and went above and beyond to help us out in any way we needed. Beautiful, homey cottage that felt so comfortable! The Whaler Cottage was indeed right on the beach and just a lovely little cottage. We spent many hours just hanging out watching the whales and dolphins right in front of us on a daily basis. They came in the morning and again in the evening. Imagine walking into your dining room, sitting down, looking out the big windows and there is a whale tail going in for a dive!! Several whales even breached for us and we were very, very impressed! Also had adorable sea otters in the kelp all day (until the whales showed up) and they are wonderful little critters to watch. I highly recommend this location. Then again, maybe I shouldn't because we want to keep going back. Can't wait until next year! Thank You so much ! Glad you experienced so much marine wildlife, it is a very special place. Rates are subject to change until reservation is confirmed. Add $195 to bring up to two dogs. 6 guests only this includes infants and children no exceptions. 60 day cancellation required for 100% refund Guests who choose to opt out of Damage Protection Plan, will need to pay a $500 refundable deposit at time of booking. Owner will file claim with VRBO/Homeaway if there is damage to the property, this includes damage done by dogs. Owner will provide Leasing Agreement & Map. Access to the property provided in Leasing Agreement.